Hanukkah starts this Sunday evening and, like most holidays, it is accompanied by traditional foods. Latkes (potato pancakes) are probably the most commonly associated, but it will come as no surprise that my personal favorite is Sufganiyot – a.k.a., doughnuts! Sufganiyot are fried doughnuts dusted with confectioner’s sugar. Why do we eat them (and other fried foods)? Because Hanukkah celebrates the victory of the Jews in a war against the Syrian-Greeks. To commemorate the occasion, a candelabra was to be lit in the reclaimed temple, but there was only enough oil to last one night. As the story is told, a miracle occurred and the candelabra burned for eight nights. This is why we celebrate Hanukkah for eight nights, and eat foods fried in oil. So, so good you guys. 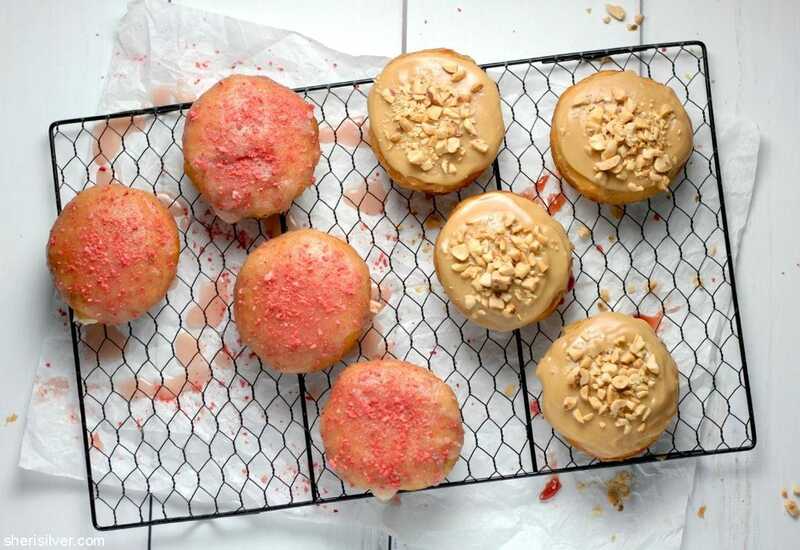 Now you “could” make the doughnuts from scratch. But I chose canned biscuit dough (yet another stalwart shortcut ingredient) to get straight to the fun part – the filling and glazing, that is. 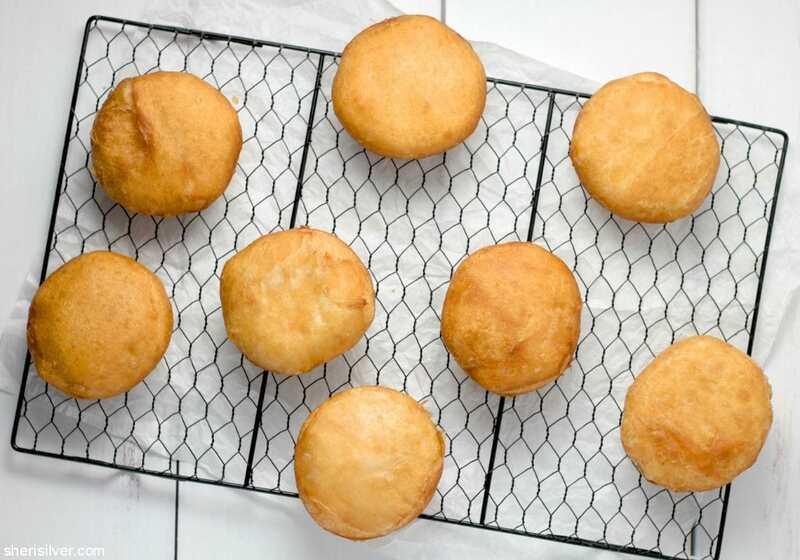 And if you’ve never tried biscuit dough for making doughnuts, you’re in for a treat. The recipes below yield enough filling and glaze for 4 doughnuts, so that you can try both versions. Simply double the ingredients if you only want to make one. But you should really try them both………. Have a wonderful holiday if you’re celebrating! Separate the biscuits and place on a wire rack set over a baking sheet. In a large pot, heat 2″ of the oil to 350 degrees. Working with 2 – 3 biscuits at a time, place in the oil and fry till golden brown. Flip to fry the other side (I use two forks) and return to the wire rack to cool. To fill the doughnuts, poke a hole in the sides (I use a chopstick but a thin knife works well too). Place the filling in a disposable pastry bag fitted with a small plain tip, or use a ziploc bag with the corner snipped. Fill the doughnuts till they start to puff out a bit (you should start to see a bit of the filling at the opening). 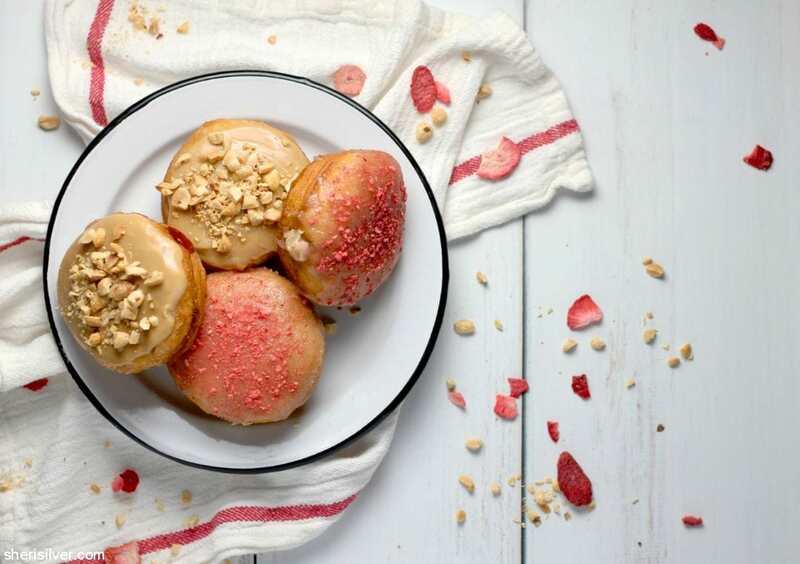 To glaze the doughnuts, spoon the glaze on top and gently spread with a small angled spatula – return to the wire rack, sprinkle with either the peanuts or strawberries, and let set. Beat the butter and peanut butter till fluffy. Add the confectioner’s sugar and milk and beat on low till combined. Raise speed to high and beat for one minute. Whisk the milk and jam till smooth. Add 1/4 cup of the sugar and whisk again. Add more sugar as needed till a thick yet “pourable” consistency is reached. Melt the peanut butter and butter together in a small pan or bowl – whisk till smooth. Add half the confectioner’s sugar and whisk again. Add more sugar as needed till a thick yet “pourable” consistency is reached. 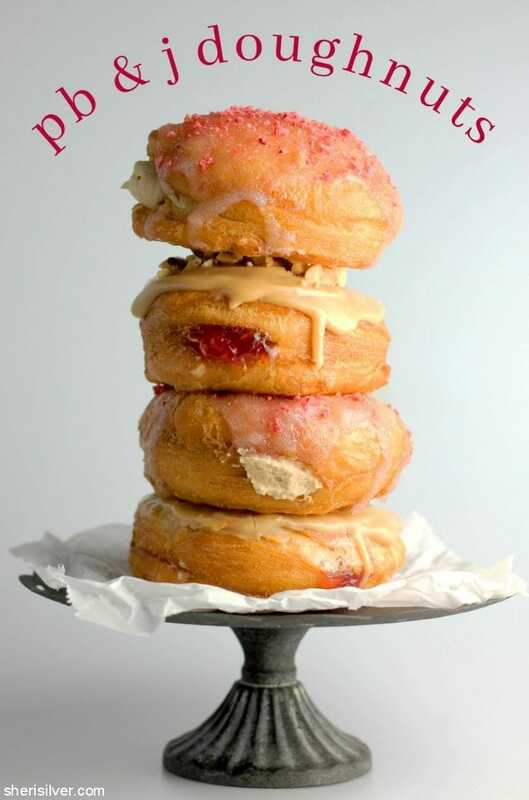 Find more sweet treats, shortcut ideas and – of course – doughnuts – on my Pinterest boards!